Fortress Of Freedom Board :: View topic - Corey Johnson "Speechless" CD Released! Corey Johnson "Speechless" CD Released! Posted: Thu Mar 17, 2011 10:21 pm Post subject: Corey Johnson "Speechless" CD Released! 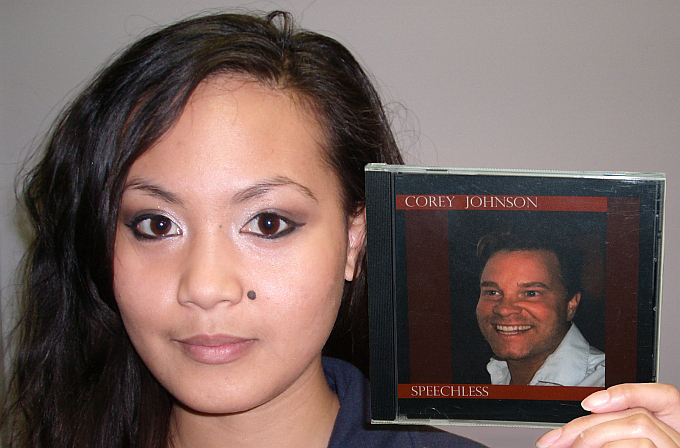 By Shane Murphy, Manager: FOF Inc./FOF RECORDS Inc.
Gracelyn Angeles (FOF Production Assistant) holds Corey Johnson's "Speechless" CD! The Fortress Of Freedom Corporation along with FOF RECORDS Inc. are proud to announce that Corey Johnson's three song single called "speechless has been released! The single is already available for digital download from iTunes in all markets worldwide and a small production run of CD quality compact discs will be available for audiophiles in the not to distant future. The single includes his hit "Speechless" along with "Best Part Of Me" and One In A Million!" We rushed the single out to be available for the FOFSTOCK concert (August 1, 2011) as well as a possible CD sampler of artist attending the concert. So from all of us at Fortress Of Freedom and FOF RECORDS, a big congrats to Corey and best wishes on the success of his latest CD "Speechless" and best wishes for Corey at FOFSTOCK! Samantha Blackwell (FOFSTOCK Production Assistant) at YDS!